Relentless sunlight baked the air to 100°F. 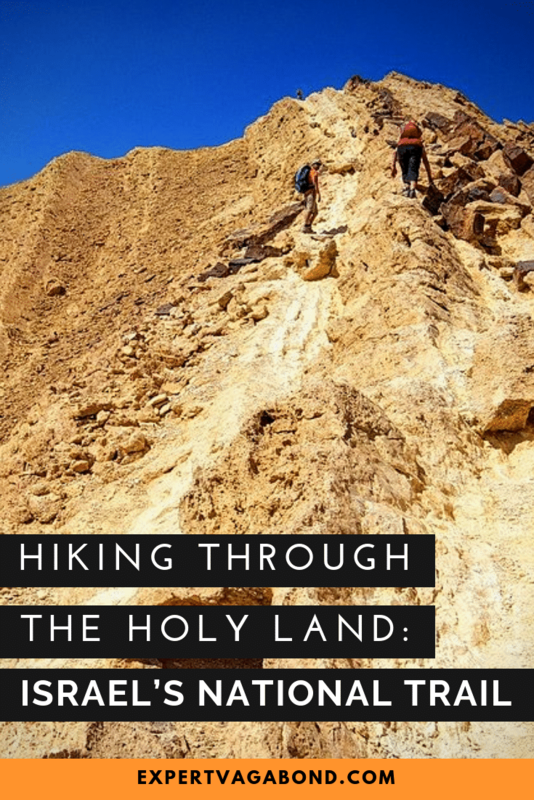 We pushed forward in the heat, one foot in front of the other across the barren Negev desert, hiking Israel’s National Trail. Never waste good shade in the desert. Over the next week I would learn to respect the importance of this golden rule. 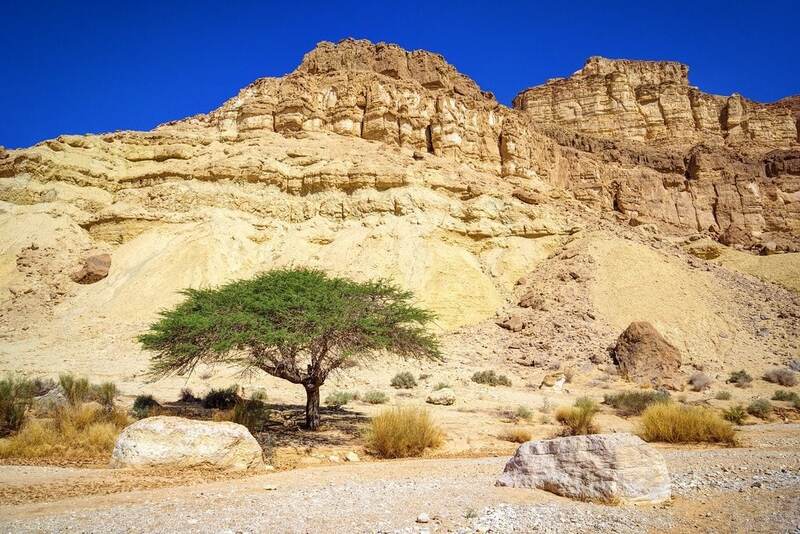 Because shade is hard to come by in the Negev, a massive desert in southern Israel. I was here to hike the Israel National Trail, or INT, with a group of international journalists, bloggers, and Israeli university students. At 1000 kilometers (620 miles) long, walking the entire trail takes 6-8 weeks. Zig-zagging through much of the country, it’s a collection of ancient local trails that have recently been merged into one. 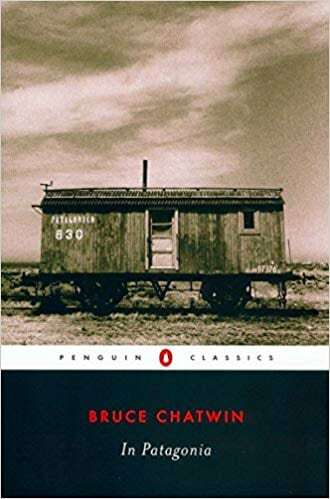 Inspired by the Appalachian Trail in the United States, the INT was the brainchild of journalist Avraham Tamir who hiked its US counterpart back in the 1980’s. Israel’s trail is relatively new, officially opening in 1995. My plan was to sample 3 different sections of the trail over the course of a week. A few days in the Negev, a few days in the Jerusalem Mountains, and a few days in the North near the Golan Heights. 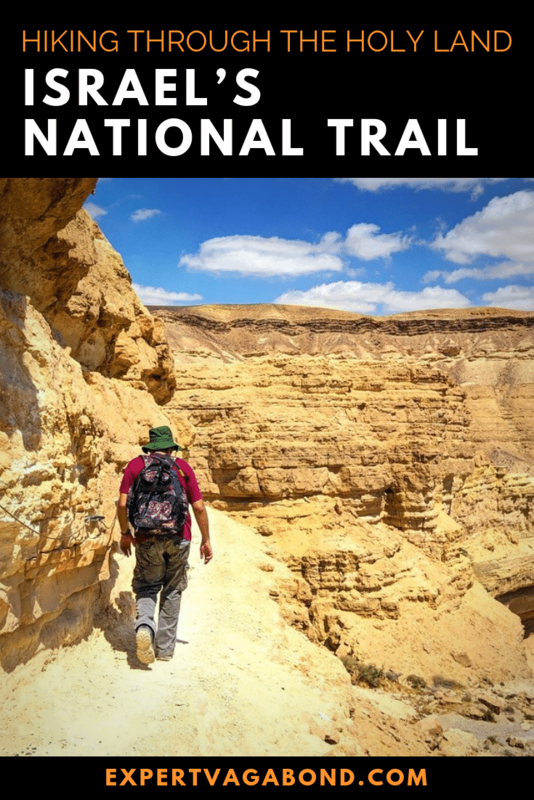 Israel’s National Trail is renowned for its mixture of unique desert landscapes, rich culture, and ancient history. National Geographic called it one of the World’s Best Hikes. Why? Because it has a little bit of everything — and you don’t need to be religious to appreciate it either. I’ve never been hiking in a proper desert landscape before. So spending our first few days in the Negev was a fascinating experience for me. Covering more than half of Israel, the Negev is vast, hot, and dry. Rare flash floods produce mud that quickly dries back up, cracking under the heat of the sun. We spent the night camped under a tarp with a full moon, eating hearty Poykeh stew cooked on an open fire. During the hike we crossed a few different makhtesh craters. These unique geological formations are created when soft sandstone is washed away by erosion, leaving behind steep walls of harder limestone. Mineral deposits in the sandstone are responsible for the colorful red, purple, blue, and orange hues found on the crater floor. This was not the kind of desert I was expecting. Rocky & varied terrain with mountains, craters, and large canyons. Trekking through a desert in 100°F / 37°C heat is challenging, but not impossible. Like any tough hike, there’s a warm up period. Eventually you get into a rhythm, the sweat flows freely, and your body adjusts to the situation. Fully hydrating before each hike and packing enough water is crucial though — at least 3 liters per person for a day of hiking in these conditions. I quickly fell in love with the silence and vastness of the desert. Despite the harsh conditions, life persists in the desert. Dry river-beds are the best place to find it. Trees and shrubs manage to pull up groundwater using a deep network of roots. On some sections of the trail, hikers must climb up crater walls. There is one in particular called the Palmah Ascent. A series of ladders, cables, and iron rungs drilled into the rock help keep you safe. This route was first opened by elite Jewish Palmah forces in the 1940’s who were seeking a way around British troops. However they were forced to climb it free-hand. An impressive feat that earned them the nickname “Crazy Jews” from Bedouin tribes. The Negev is full of different wadis, or desert canyons. The Israel National Trail passes over them, through them, and up the canyon walls. While formed by water, it’s rare to see water flowing down them, other than the occasional winter flash-flood. During these floods, wadis can fill up quickly though. There are even waterfalls. Parts of the trail can be pretty exposed with sheer drops — steel cables are in place if you’re afraid of heights. 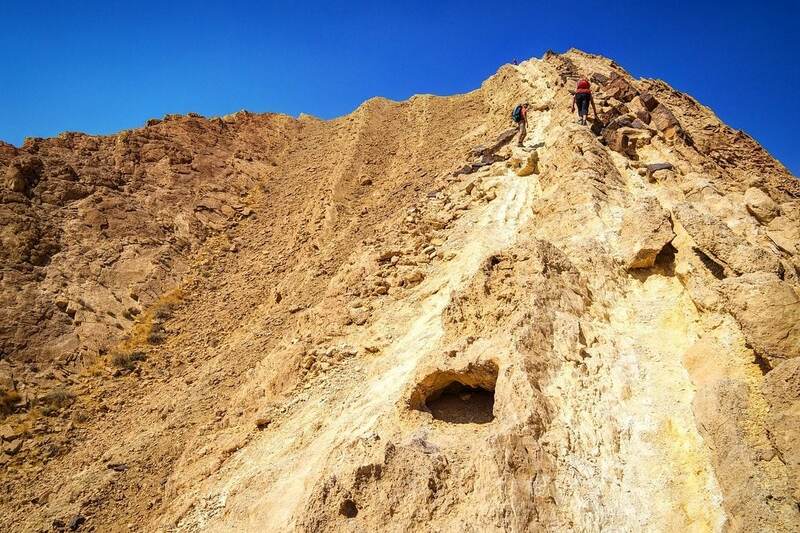 A popular hike along the trail is the Big Fin, a short but slightly more difficult climb up the side of a Makhtesh crater with spectacular views of the natural amphitheater below. Caravans of camels used to travel through the Negev desert from Yemen to the port city of Gaza loaded with spices, perfumes and salt. It was an important trade route used for thousands of years. 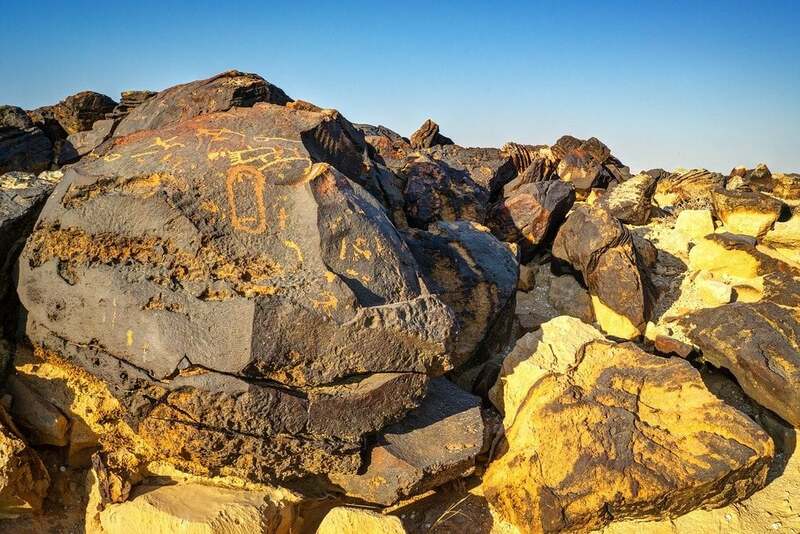 Ancient petroglyphs carved into rock patina can be found here, some up to 2500 years old. Researchers believe they are property markers for tribal families. Most depict rudimentary figures of people and animals, like the Ibex. 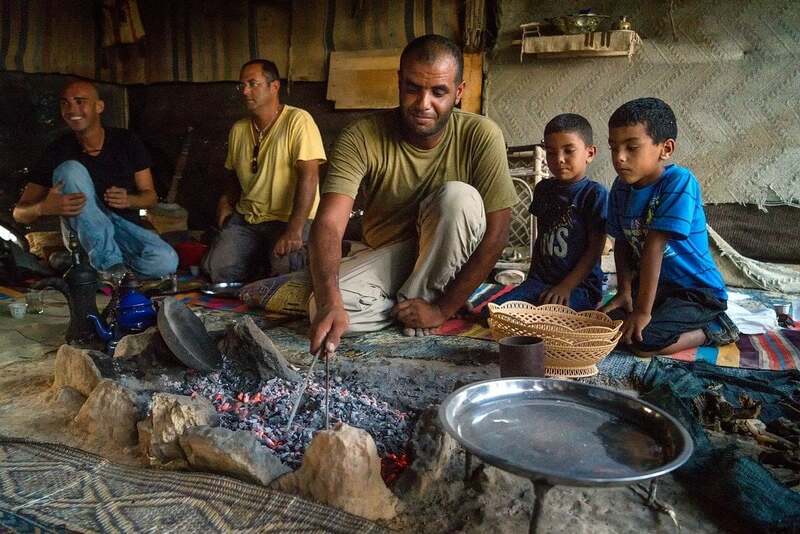 We stopped by the home of Salem & his family, who prepared delicious flat bread in his traditional desert tent. Plus Arabic coffee “strong like Bedouin men, bitter like life in desert, and black like marriage”. Israel’s Bedouin (or Negev Arab) communities make their living keeping livestock like sheep, goats, & camels. Tourism is increasingly important too. Salem offers accommodation for Israel National Trail hikers. The Israeli desert hosts a few different animals, most of them nocturnal. One exception is the Nubian Ibex, a wild goat that scavenges for scrub grass during the day. Other animals include the hyrax (a large rodent), deer, fox, hyenas, wolves, and the camel. A few poisonous animals live here too, like the Israeli Mole Viper and the Deathstalker scorpion. The only animals we came across were a herd of wild Ibex and camels at a farm. A special local community of people provide accommodation, water, dinner, or showers to hikers of the Israel National Trail. They’re called Trail Angels. Many offer these services free of charge. In the town of Sde Boker we stayed with Arthur, a long-time trail angel who generally hosts 8-10 people each hiking season. He’s also famous for catching a rare wild Arabian Leopard, in his bedroom! After 2 days trekking in the desert, we moved North to the Valley Of Elah and the Jerusalem Mountains in the center of the country. This part of Israel is much greener and full of history. Hiking up Tel Azekah gave us a view of the valley, where legend says young David killed the Philistine giant Goliath using a sling. A trail took us down by the creek where this battle is supposed to have happened. After 2 days around Jerusalem (which I’ll detail in a separate post), we headed North again. This time to the Jezreel Valley and Lower Galilee region. The valley is a large fertile plain used for farming wheat, sunflowers, cotton, and corn. Slightly more lush than the arid desert landscape we started from in the South. 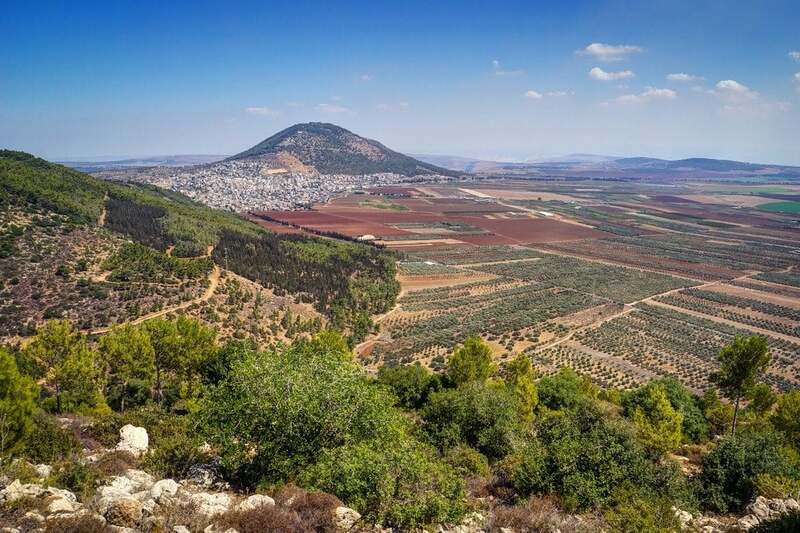 We hiked up Mount Tabor which sits in the middle of these fields, with a small church at the top run by Franciscan monks where Jesus supposedly “transfigured” and spoke with Moses. 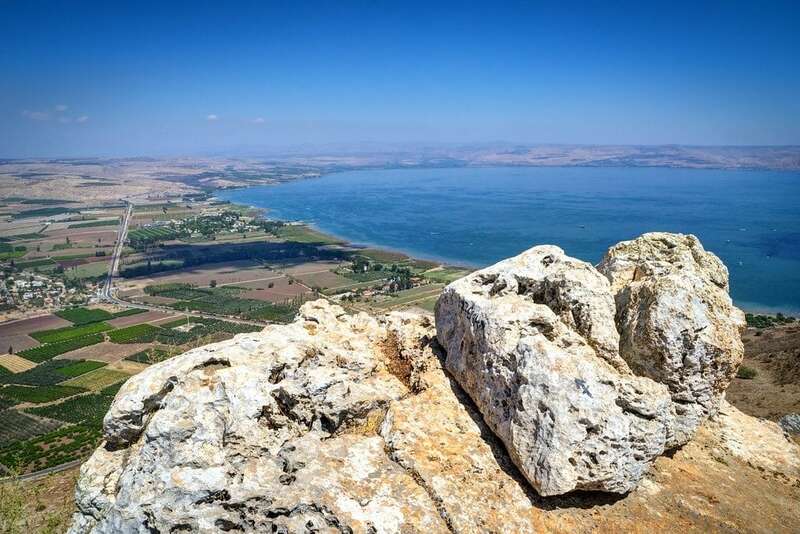 After a night of eating some of the best food I’ve ever tasted with a Druze family, we climbed Mount Arbel for a magnificent view of Lake Kinneret, aka the Sea of Galilee. For Bible fans, this is where Jesus supposedly walked on water. Today the lake is Israel’s largest source of drinking water. 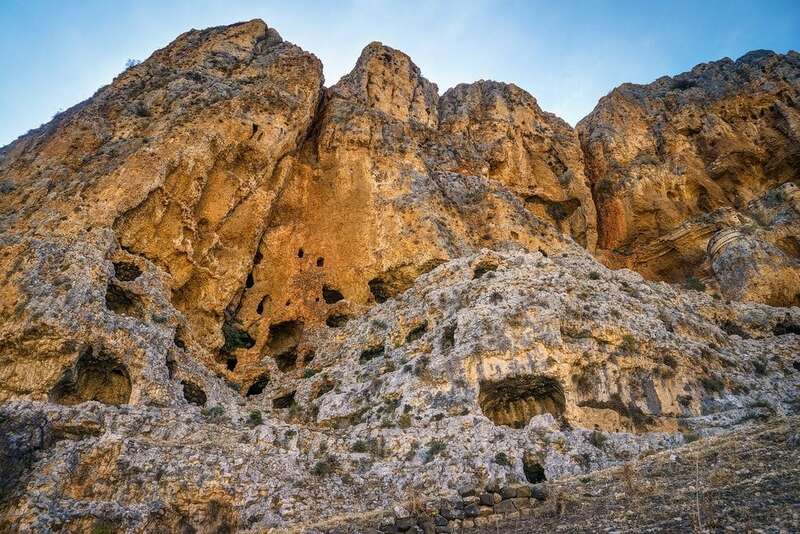 A trail takes you past ancient caves carved into the side of a cliff. Once a fortress, it’s still possible to climb up and explore them. 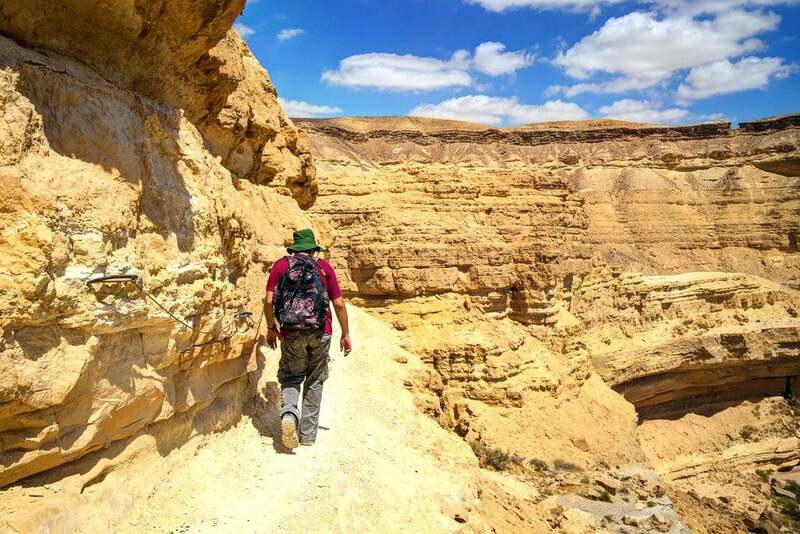 Passing through harsh but beautiful desert landscapes, green hills and lush valleys, Jewish kibbutz farms and Arab Bedouin communities, remote wilderness and international cities is what makes walking the Israel National Trail a unique adventure. Not to mention meeting local people from varying faiths and backgrounds willing to share their homes & hospitality with us. My favorite part? 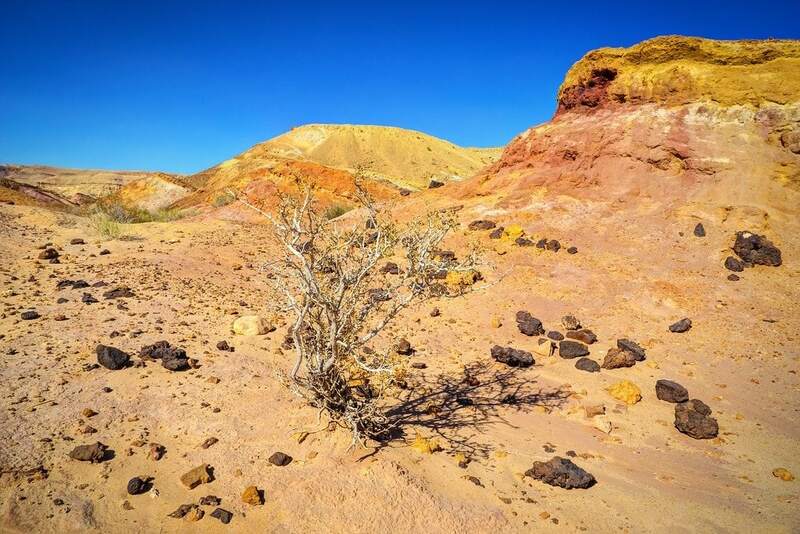 The Negev’s desert environment. It was not what I was expecting — very different than the type of mountains I’m more accustomed to. The heat, the changing landscape, and the solitude I found there have inspired me to visit other deserts. 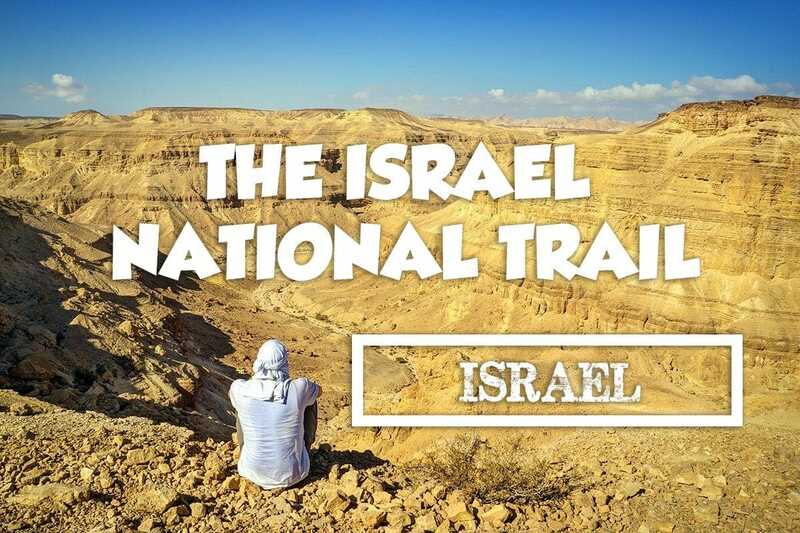 Have you ever heard of the Israel National Trail? Would you hike it? Drop me a message in the comments below! What are the safety and security issues one has to consider? The INT is one of the best hikes I ever been to. Thanks for sharing! The INT is totally on my list! I’ve spend an overnight in the Negev last year and can’t wait to return! This is a wonderful resource , I really enjoyed reading your wonderful account of the varying portions of the INT. And i’ve became even more inspired. I’m planning on doing the entire INT in Spring 2019, as yet, I’m going solo – but hopeful I’ll meet others along the way, or even a group. I really enjoy long hours of solitude but feel that hiking the desert alone might not be wise, also I’ve one paralyzed arm and some of the ladders are certainly scaring me ( a little). Thank you. Can you offer any insight on the process of water caching? 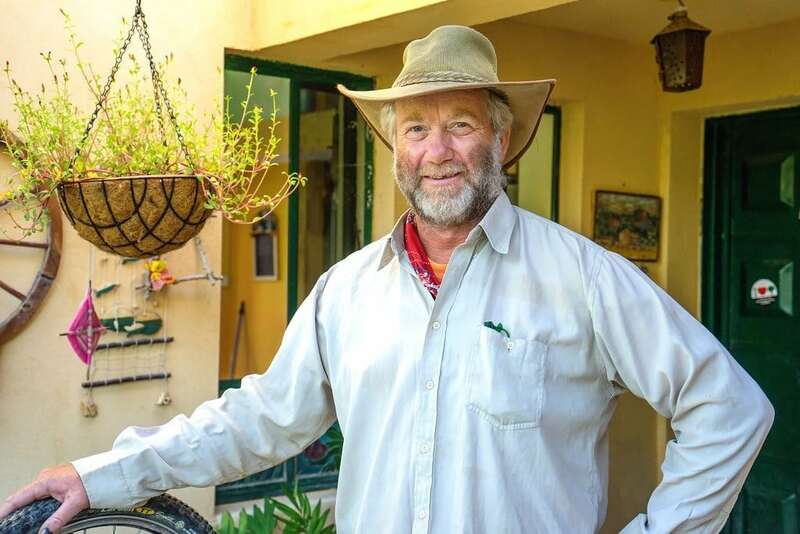 Hi Matthew, I am thinking of doing something similar to your walk in the near the Makhtesh craters – just a few days as part of a short trip to Israel. Which days of the INT did you hike? How many nights did you manage to stay with Trail Angels? As I’m only there for a short time I’m trying to arrange a few days walking that doesn’t require a tent. Thanks! 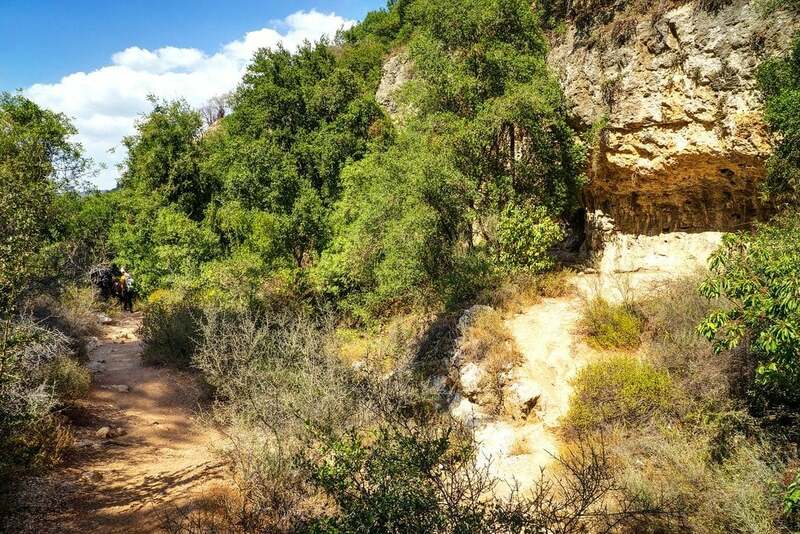 Hello, i am travelling to Israel in acouple of weeks and I am interested in do some hikes in the souther desert, jerusalem region and the north as you did but I am traveling alone so what do you recomend me as I will need a guide. Hi. sounds awesome…im planing a trip to israel in january and by coincidence heard about the trail. would you be so kind and give some more details on how to get there. thanks a lot. There is an Amazing Group hike that attracts thousands of people starting Feb. 18-April. I’m not sure what the link is but it is in honor of Avi a fallen soldier and you can hike the entirety or portions. There are support vans to carry your heavy packs, tents, and gear, and lectures every day for a couple of hours. Food is bought and brought to the sight where everyone shares in cooking and at night if your not too tired you can sit by campfires where people will gather to sing songs and tell stories. I’ve heard it really something unforgettable. Registration opens up in December and donations for food and volunteers I believe is about 100-200 shekels per day in addition to whatever you feel comfortable with to tip. Hope this sheds some light. Thank you for your comment. I’m desiring to hike the entire INT, starting in the south; January – February, I’m an experienced solo hiker, but I’ve been keen to find a group that I might hike with. I’m going to look – thanks for the tips. Great descriptive post about your experience. I also love the desert in the south, but its important to not do it during the hottest months of the year. Yes! Good tip. 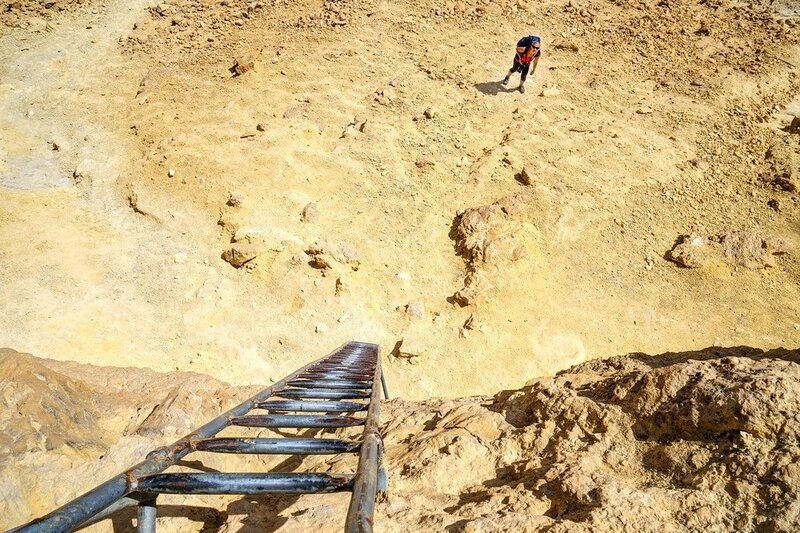 Hiking through the deserts of Israel during the peak of summer can be very dangerous due to the heat. Beautiful photos. 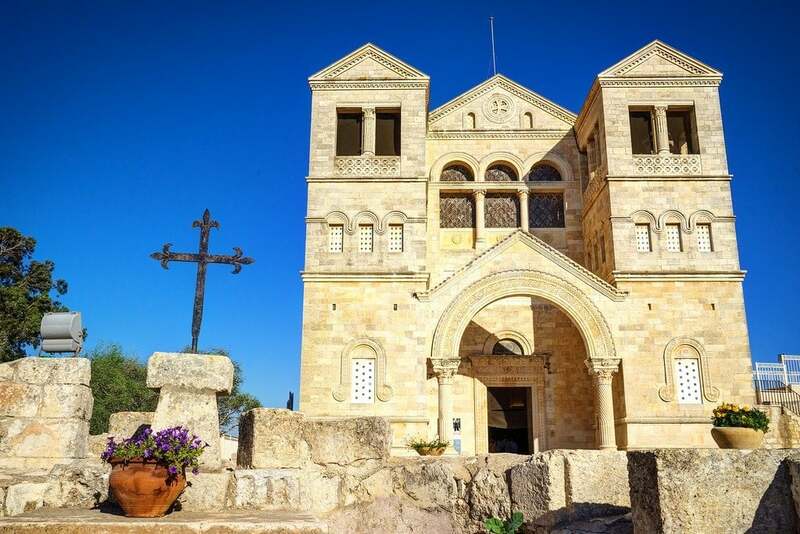 I grew up in the Judeo-Christian belief and had Bible bedtime stories–and although I am not as religious anymore, Israel still continues to captivate me. It looks like you need to be very fit and active to conquer the trail! Having done the INT several times though – in my opinion packing only 3 liters of water per day per person in 37 degrees sounds highly irresponsible! One should be drinking much more than that, and also best to hike during the early and late hours and spend the hours in the middle resting in the shade. 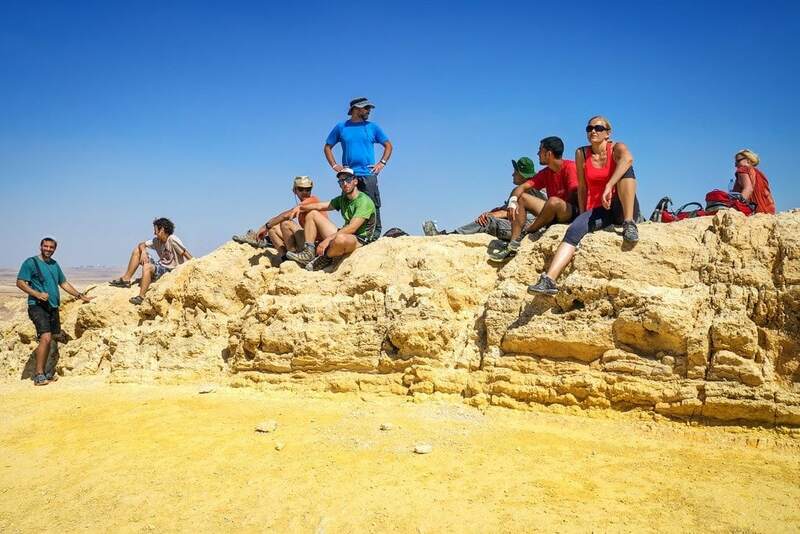 Most Israelis would not think of hiking the Negev long-distance in the summer! Death from dehydration or heat stroke happens here too often, and people who are not seasoned desert hikers should not take this risk. 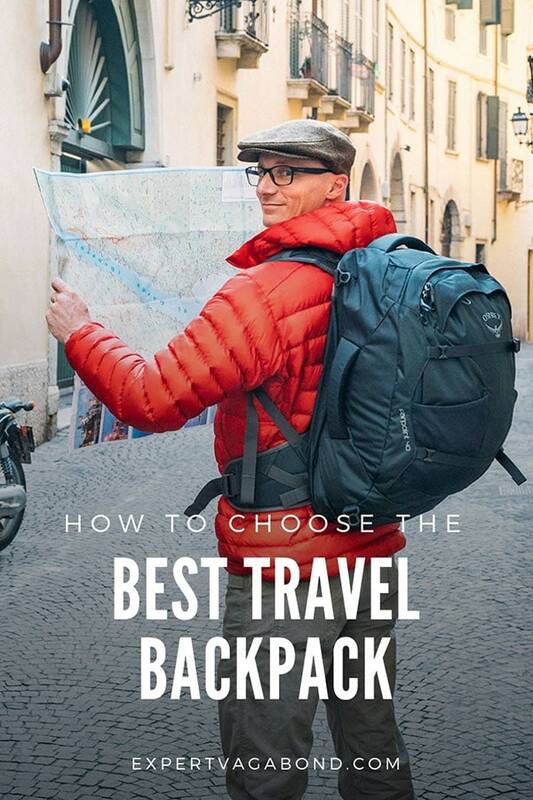 It’s meant to be a recommendation on how much to pack with you each day, not how much to drink overall. Fully hydrating before you leave each morning and when you make camp in the evening is crucial. I more than agree. 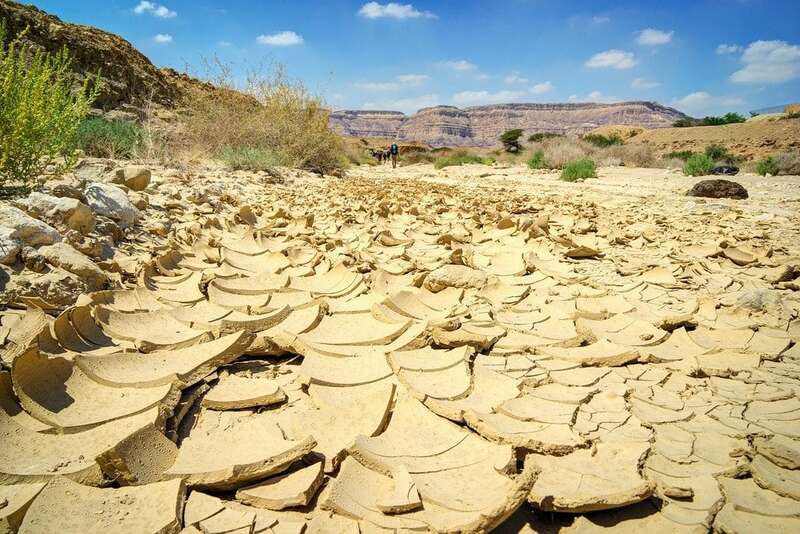 I was completely shocked that someone would hike in the Negev in the summer- and carry half the water needed. Maybe less than half- I’ve been in places (Jordan Valley in July) where you need to drink a liter each hour to keep from dehydrating. Wonderful pictures! 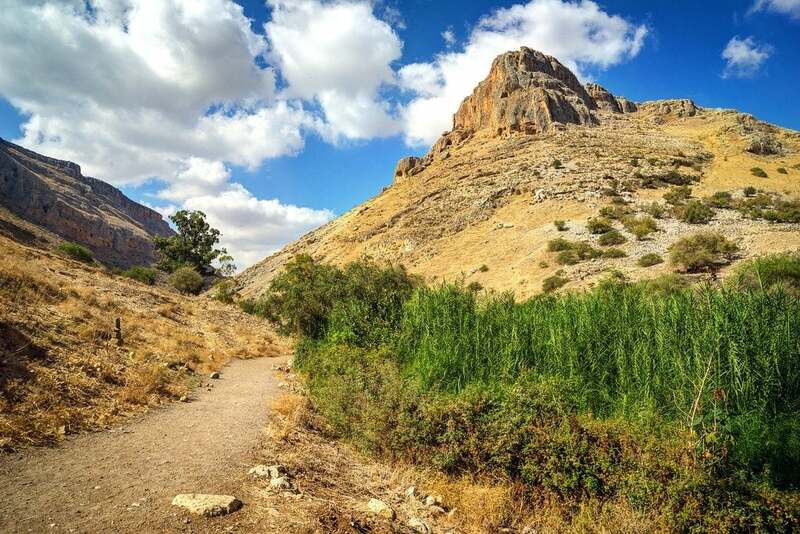 I have hiked The Jesus Trail in Galilee, which follows Israel National Trail over Mount Arbel and the Ginosar Valley. 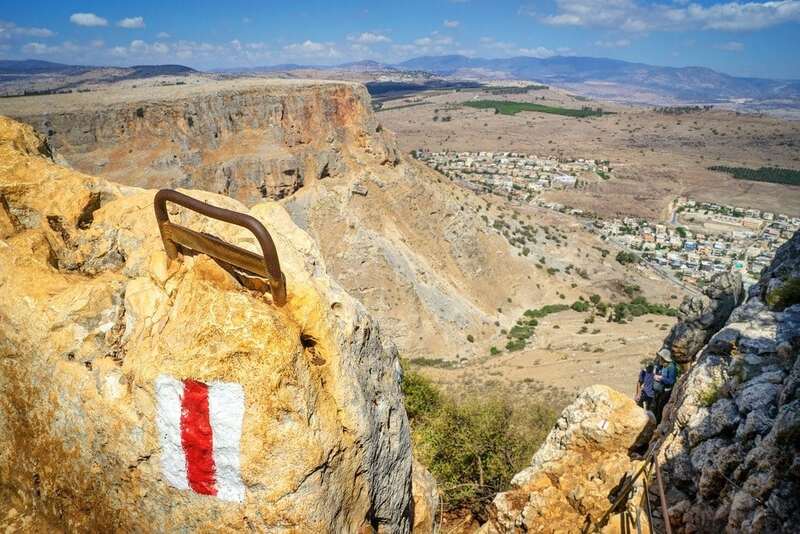 It´s a 65 km hiking route from Nazareth to Capernaum. I will go back later this year, and your post was inspiring. Thanks for posting this! I’ve subscribed to your newsletter so I can keep reading your blogs and abreast with your travel experiences. I’m sharing your blogs too in our Facebook Page ( Le Soliel Travel & Tours) for our viewers and followers to read your immensely interesting blogs and photographs. Really enjoyed the post! Good stuff! These photographs are beyond beautiful. I have only one thought right now – I want to follow the same trail as yours. Israel is already on my bucket-list not just for its beauty, but for its awe-inspiring history. This post has only added to my curiosity. Thanks so much! I’m not sure I would enjoy hiking in such heat, but your photos definitely make it look beautiful! Wow, great post! Love how the scenery is so different in each picture. Oh WOW! This is so stunning. What an incredible experience! I went to Israel last april and was extremely impressed with those ibex running and jumping between cliff walls with such ease! Beautiful pictures and sad I didn’t know about the National Trail, would have loved hiking it. Theres always a great excuse to go back to Israel specially to eat Shesek. For such a small country, Israel has a lot of cool stuff to see. Looks epic and exhausting! Wonderful photos. Was it safe out there? Have you written anything about the safety of Israel following the recent war? I felt safe the whole time, and spent a few days traveling in the West Bank too. Will be writing about that later. Hi Matthew, I follow your blogs with great interest. My wife and I have been away from home only 6 months this year, but managed to take on several countries that were new to us. Great times. Reading your article here makes me think again about the place of travellers as we move in and out of politically sensitive zones. Personally although I have lived in Jerusalem, I could not now consider any travel in Israel that might in any way be seen to endorse what the state is doing to the Palestinians. So any connection with groups like ‘Stand With Us’ would be supporting the Israeli Govt and its apartheid, undemocratic regime. The whole question of which countries we should visit and which ones not is something that rarely comes up on travel blogs, for good reasons, but I think it disingenuous to pretend that these things don’t matter. I mean, there are plenty of travelers who contribute to improving poverty and the environment. I think th at by the same token, there are some political lines that we shouldn’t ignore. Hopefully, one day, when a fair, two state solution has been put in place, I can return with a clear conscience but that time is certainly not now. Looks like a great walk by the way! You are of course entitled to your opinion John, however for me personally, if I made my travel decisions based on politics, environmental concerns, and human rights, there wouldn’t be many countries I could actually visit. Including the United States. I don’t cover politics when writing about hiking in other countries, I’m not going to here either. I love how the landscape changes at every new turn! Gorgeous photos as always. Looks like a fascinating experience! I love that shot of the Ibex. So majestic! It was a wonderful hike. 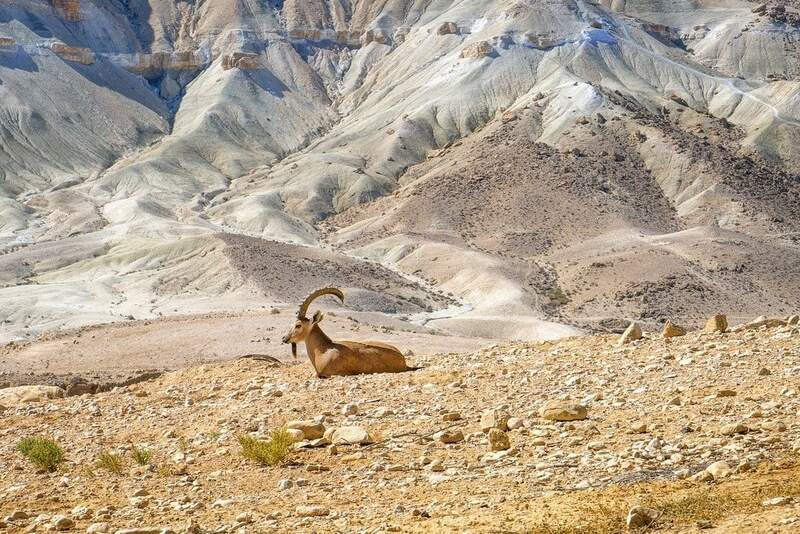 Yeah the Ibex is cool — although not for Israelis because they see them all the time. However I could’ve stayed with them for hours taking photos! Some of them had much bigger horns, but I couldn’t get close for a good shot. Damn that looks like some beautiful trekking! I’ve been real keen to do the Lebanon Mountain Trail, and will now have to add this one when we get to the Middle East next year. Doesn’t look like there was many places to string up your hammock though. Tent a better option? Actually, you don’t even need a tent. A sleeping bag & mat is enough. Maybe a small tarp to help keep out of the sun.